Clicking, snapping, popping – whatever you want to call it, you know those noises from your jaw could be signs of trouble. When you feel pain alongside these symptoms, it might be time to contact a dental professional about TMJ. TMJ, or temporomandibular joint dysfunction, is a condition that results in jaw pain, difficulty chewing, clicking and locking of the jaw. The temporomandibular joint connects your jaw bone to the temporal bones of your skull. You have one on each side of your face, directly in front of your ears. The joint, which moves like a hinge, allows you to move your jaw around and perform normal, everyday functions. If you’re unsure whether occasional clicking might be signs of early TMJ, visit your doctor or dentist for a professional diagnosis. They might refer you onto a TMJ specialist, depending on the severity of your case and the treatment needed to provide you with relief. Often, pain occurs because the disk is moved out of its natural alignment. 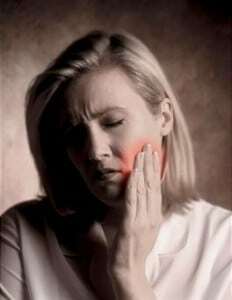 Patients with arthritis, past jaw traumas or a tendency to grind or clench teeth are at a higher risk of developing TMJ. 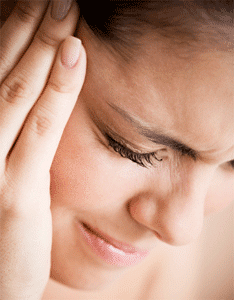 Stress acts as a major instigator of TMJ disorders. Unfortunately, TMJ can be chronic and last years if you fail to combat it in its early stages. Often times, locking prohibits individuals from chewing, opening or closing their mouths, resulting in a cumbersome lifestyle. Luckily, TMJ is treatable. Depending on the severity of your case, your specialist or dental professional might recommend steps as simple as self-care all the way to jaw surgery for anatomical irregularities. If you experience light clicking without pain, it’s important to assess your lifestyle and stress levels. Clenching of the jaw and jaw pain is a common reaction to feeling emotionally or physically overwhelmed. Practice meditation techniques, yoga, light exercise or take up a healthy hobby. Gardening, cooking, reading and journaling are relaxing tactics that many people rely on in for a wholesome lifestyle, regardless of whether or not they suffer from TMJ. Patients may also participate in therapies, such as acupuncture, stretching or biofeedback – a process that involves electronically monitoring movements for a more precise analysis. Often, a dental professional will supply you with a splint or mouth guard as the basis of your treatment. These dental devices help limit irregular jaw movements and prevent grinding of the teeth at night. The splint keeps your joint in its proper place to further healing, while a mouth guard prevents you from damaging your teeth and gums any further. If pain is still present, you might be prescribed an anti-inflammatory drug, muscle relaxant or sedative. If your TMJ is the result of misalignment in your jaw – whether inherent or due to impact – you may require orthodontics and surgical intervention. Again, these procedures are typically reserved for patients with extreme overbites, underbites or crossbites initiating irregular jaw movements. If you suffered an injury to the area, an operation might help re-align the joint back to its proper placement. At Assure A Smile, our patients undergo a comprehensive evaluation which includes a TMJ scan. If diagnosed, we can help determine your personalized treatment plan to get your jaw back to functioning properly and pain-free. To schedule an appointment, contact our office at 305-274-0047. TMJ is a painful condition that may significantly inhibit one’s ability to chew, bite, and even hear. Many body tissues may be affected by the condition, including muscles, nerves, tendons, ligaments, and teeth. The teeth, particularly, may have a strong affect on the development of the disorder, making TMJ an area of special interest for holistic dentists. This article is a basic overview of the disorder, its symptoms, and treatment options.